It’s big, it’s bad, and it’s out of beta. Minecraft finally released in full last month with a number of changes to it’s core formula. Now I can finally give full review to a game that we’ve all been playing for so long. Minecraft is at once a sandbox building game, a survival horror game, and an online world for you and your friends to explore, decorate and decimate. I, probably like many, started offline in my own little world. The first night used to be a terrifying thing (ask Beta about spending hers in a tiny hole, burning wood in a furnace for light, pre-charcoal). Nowadays you can gather wool to make a bed and sleep the night away, taking away that thrill. Of course, if you make a mistake building your bedroom, prepare for visitors. Mining up ore, stone, and other materials is obviously a huge part of the game. Using them craft tools and different useful objects is another. When you start finding rarer materials deep underground you really get an appreciation for all the flexibility you have in the crafting system. However, it’s when you put tools, materials, and crafted goods together to make the world your own that the game’s genius truly shines. Whereas once there were only a few objects to build, you can now use the likes of pistons, note blocks, and redstone to put together a lavish entrance way to your new fortress/home/hole in the ground. Building yourself somewhere to call home is paramount as the night is filled with bad things that would love to eat/shoot/explode you. From the run-of-the-mill zombies to the enigmatic and building-wrecking endermen to the ever-annoying creeper you have your hands full with these bumps in the night. My biggest gripe is that the sun, which burns up most all of the baddies, doesn’t do diddly squat to the damned creepers – more on my pains with them in a minute. 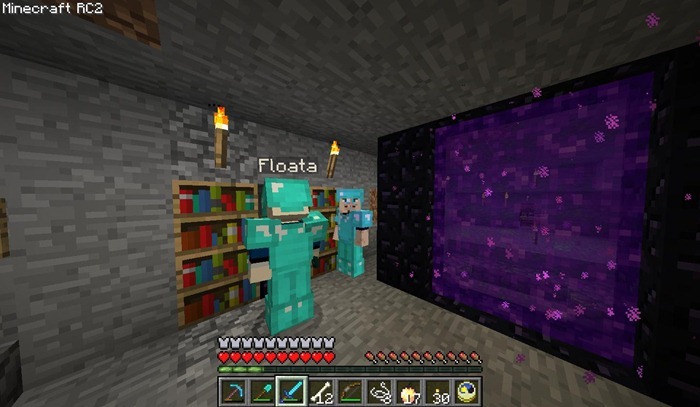 With some lava, some water and some know-how you can travel to the Nether via a portal. This is a deadly, deadly place, Minecraft’s answer to Hell. Once bad enough with zombie pigmen and ghasts – explosive fireball shooting jellyfish of doom – there are now a host of new baddies to watch out for, like blazes and magma cubes. The benefits of going to the Nether are using it as a fast-travel method (distances in the Nether are multiplied 8x when you return to the normal world) and materials you can’t get anywhere else like the awesome glowstone. Playing solo is fun, if a little boring, so you’ll probably get the urge to go online and play on a server. I run one for Omega, Beta and I and I can say with confidence that for me it has made the solo experience nearly obsolete. Why risk your neck underground by yourself when you could have someone watch your back? Building cooperatively is also more fun, if more chaotic. When Omega and I built our castle it was a bit of a touch-and-go operation at the start as neither of us really had a grand vision for the thing. We were just slapping down blocks left and right, hoping that our combined works would produce something beautiful (surprise – they did not). Patch 1.0 – the full release version – has brought with it some new features. There are now enchantment tables, potion brewing stands, and a new realm called the End, which has a very dangerous dragon as it’s primary denizen. The experience orbs that were added prior now fuel the enchantment system and are now fun to accrue and use. The down side to the full release, at least for me, is that the monsters seem to be a little more rampant. When I logged onto our world one night I saw, in the front of our castle, a hole. In front of the hole, was a crater. Around the crater, trying to mosh in the hole, were five creepers. Apparently a creeper had caught Omega out and blew him up trying to reenter the castle. I slapped dirt in the hole as a stopgap and proceeded to head upstairs to shoot the creepers from another floor. After killing an enderman en route through the building, I sniped four of the creepers as the fifth wandered off. I turned back to go downstairs again and saw a creeper coming up the stairs. At what point did the creeper breeding season kick in?? I fought six in the span of a few minutes, just in front of and inside of my own well-lit house. That’s not right. 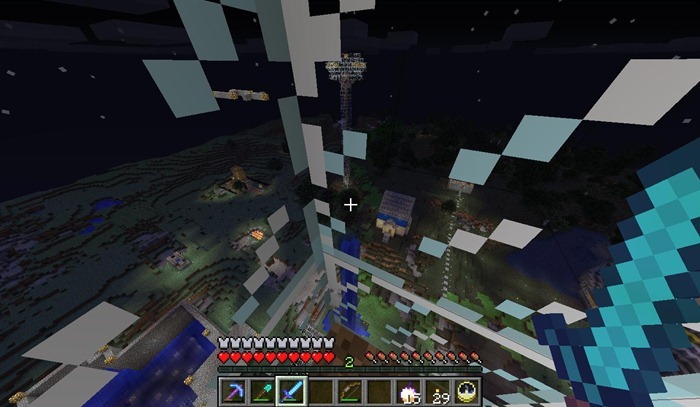 Minecraft is, as I once argued, what you make of it. Find some friends or get a good solo world going and it’s some of the most fun you can have on the PC this year. If you’re not creative minded or need the game to guide you through and give you explicit reasons for where you are and what you’re doing, you’ll find no fun here. For the staff here at AAGH, myself included, we like it. I like Minecraft a lot and yes, Creepers are damn annoying. I have nothing to add to the review really, but do want to note something from my own experience. I some cases with massively adding or removing lines from some material, it did get a bit crazy on my sight. With the mass adding which I did for some big project, I got ‘tunnel vision’ and felt a bit light in the head. Had to take a break from it. With mass removal of stuff in the same way, I didn’t get ‘tunnel vision’ but it did get pretty annoying on the eyes. This may just be me, but it was a less pleasant experience I had in Minecraft.